As I’m getting to know my fellow officers, I’ve learned that several of them are as much into hiking as we are. I indicated our interest in doing a hike with them and they were quick to include us. On Friday, they informed us that that weekend’s hike was Ka’ala (Kah-ah-lah). 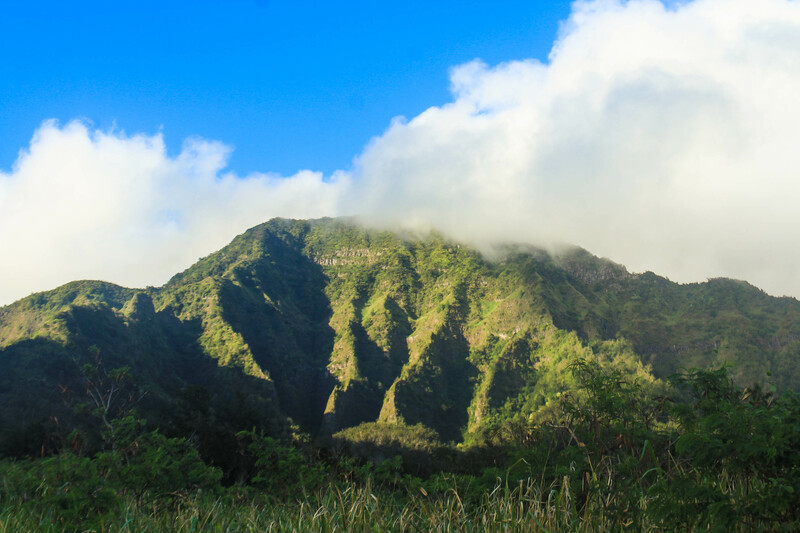 At about 4040′, Ka’ala is the highest peak in the Wai’anae Range (Why-a-nye) and the highest point on the island. Having endured the overgrown muddiness of Pupu Kea the week before, we felt that we could take on the challenge. We got a late start that day because one of our hiking partners was coming off duty, but managed to meet at the trailhead by 11-ish. The trailhead was off of a backcountry road in a less than friendly appearing area. We made sure to sanitize our cars of any valuable items and then hit the trail. The first mile of the hike was along a rather exposed service road leading to a water storage/treatment center. There were a lot of mesquite and ironwood trees and it reminded us again of Southeast Arizona. But as we moved further up the valley and up in elevation, it became much more lush and we even saw a passion fruit vine, or lilikoi. As we moved past the water treatment center we entered into a grove of nut trees that our friends who have had more experience with tropical plants were quick to identify as Macadamia Nuts. Always wanting to learn about local flora and what is safe to eat, I tried a few and filled my pockets. At this point, the trail began to go steeply up the back of the valley to meet up with the ridge. It was slow, plodding going at this point and most of us were soon once again drenched in sweat. I made note that one of our friends wore a moisture wicking shirt that kept him mostly dry. 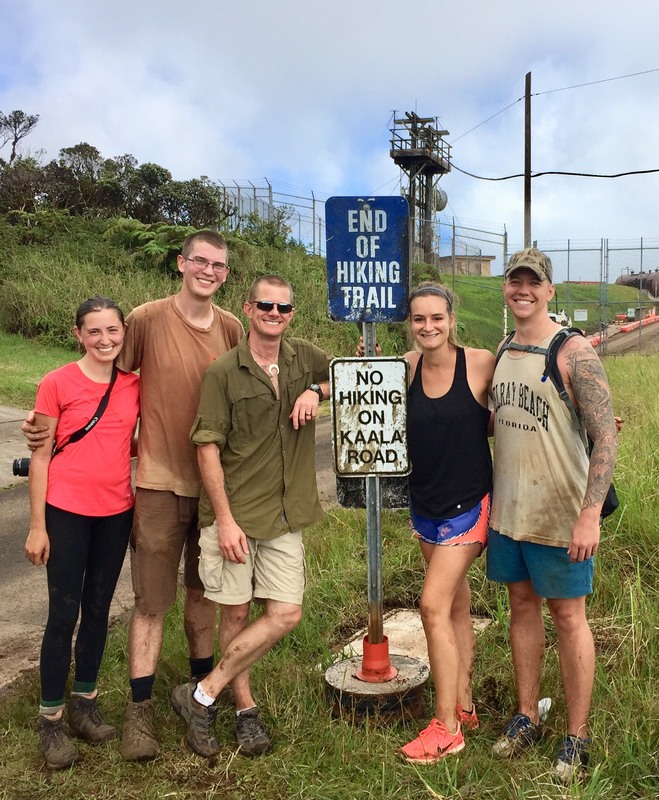 If we were going to seriously hike in Hawaii, I would need one of those. At the crest of the ridge we met the Pig Fence. Wild pigs populate and cause much damage to a good portion of the island. In an effort to control them, the state allows year round hunting and places these long fences along many of the ridges in the Ko’olau and Wai’anae ranges. How the pigs navigate theses steep cliffs and ridges, I’ll never know. We followed the fence up the ridge toward the summit area, slipping along the more eroded trail. Then we finally saw what we were up against. 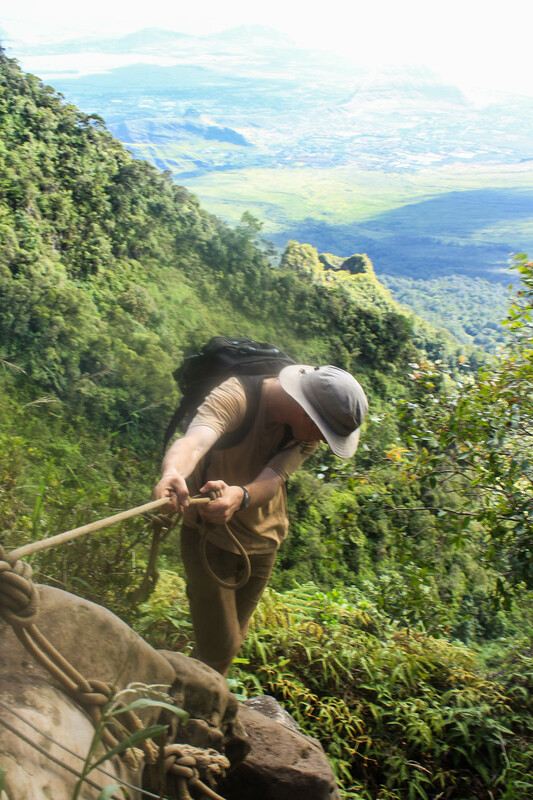 Up until now, the trail had been steep, but manageable with minimal ropes. Here, the summit massif rises suddenly and steeply from the ridge we were following, forming a rather continuous cliff that we would have to climb up. I never bothered to count the number of roped sections, but there were many. Some perhaps 50′ long, going up the heavily eroded and muddied ruts. It was slow, dirty going, but manageable. 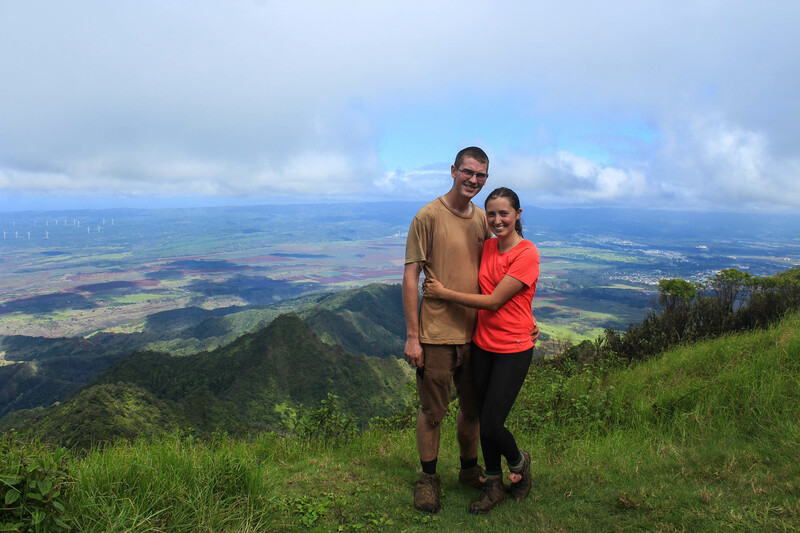 When we finally reached the top of the cliff it was definitely worth it, offering unobstructed views to the West (Leeward) and all the ridges coming off the Wai’anae Summit down to the ocean. While it had been difficult getting to this point, I know that getting to any of those more distant ridges and peaks would be even harder. Ka’ala was a relatively popular trail with at least a couple people doing it a week. 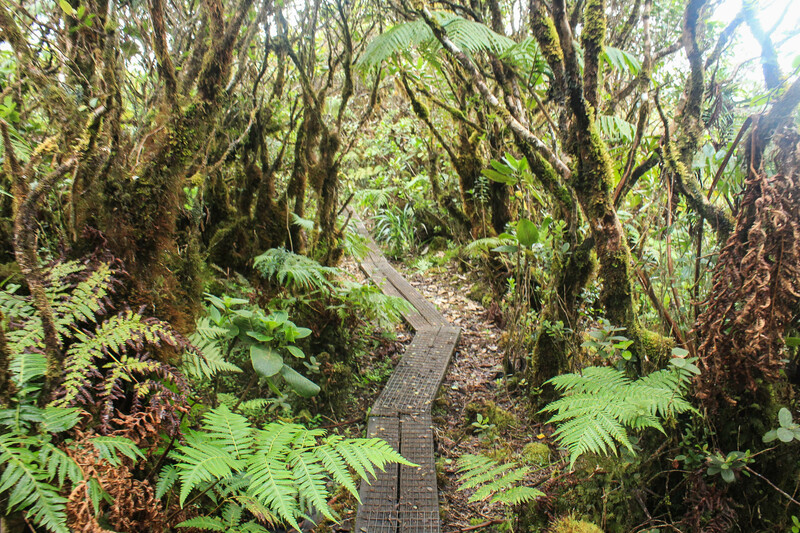 Those other ridges would be more overgrown like Pupu Kea and perhaps wouldn’t even have the ropes or a trail. While we had made it to the top of the cliff, we were still perhaps a half mile from the true highest point of the island. Unlike almost every other peak on the island, Ka’ala has a relatively flat summit with a bog covering most of it. But after gaining 3500′ in 3 miles, it was nice to just stroll along the ‘boardwalk’. On the other side of the bog we came out onto the Ka’ala road and the Army Installation at the summit. We ate our lunches (and my pocket of Macadamia nuts) and then walked around the Installation. 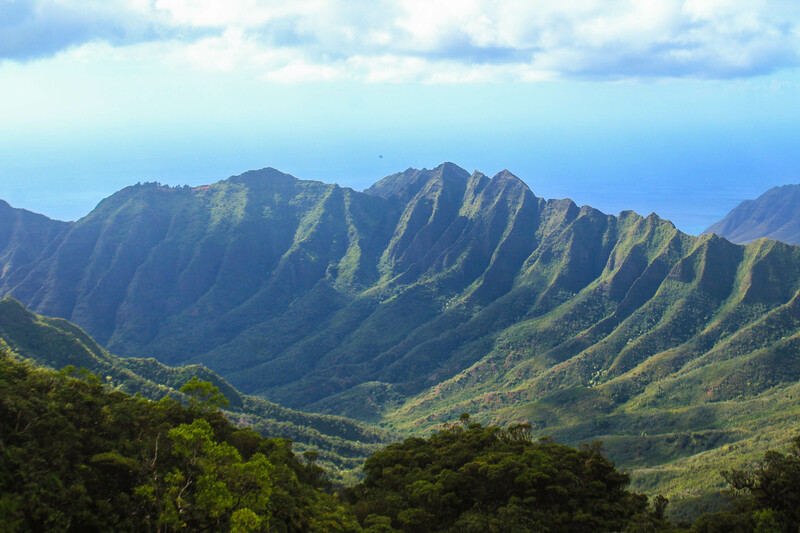 The Eastward side offered great views of the valley and the Ko’olaus beyond. Truly we were fortunate to have been able to see anything at all, considering that most days lately when you look towards Ka’ala it is covered by clouds. We joked briefly about walking down the road rather than face the cliff and ropes again. But were soon back on the trail through the bog. It was slow going, especially for Jess and I, and we were quite fortunate that our friends were patient with us. They had had a bit more experience with climbing up and down muddy slopes than we had. We figured that it’s better to take these sections slowly than to misstep and fall off the side of a cliff. By the time we reached the macadamia grove it was approaching sunset, so we picked up the pace and trotted down the road. Back at the cars we were glad to see both cars in our party were ok, which is more than we can say for the other vehicle at the trailhead which had a window smashed in. It does happen quite a bit so we hear, especially on the Leeward side. Some people just leave their vehicles unlocked at trailheads it’s so bad. Our advice would be to make sure you have nothing in sight — valuable or not. We loaded up the cars quite tired and ready for pizza for dinner. Up until this point, Jess and I had been doing 2 hikes each weekend, but the next day we broke that trend and took a much-deserved lazy day!